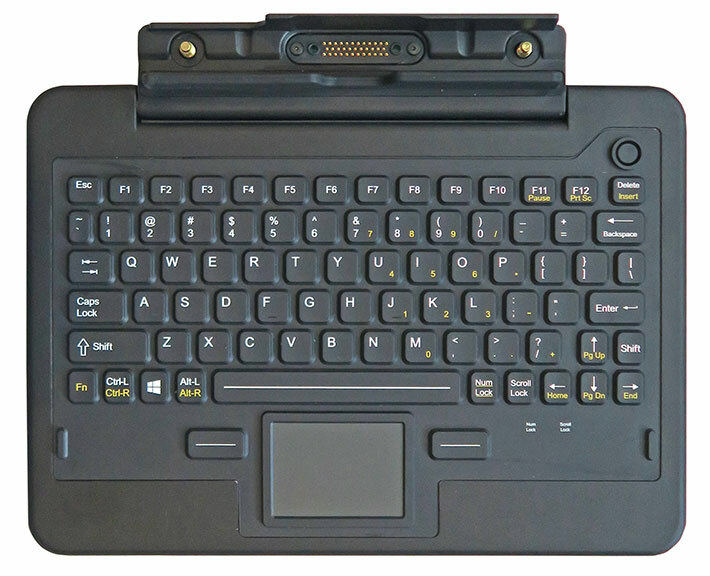 On July 14, 2016, GammaTech announced it was now making available a special keyboard to go with its thin, lightweight DURABOOK R11 rugged tablet. That way, the R11 could work not only as a tablet, but also as a laptop, making it a more complete high-performance mobile computing solution. The resulting combination can be used for any mobile application subject to constant movement, bumpy rides, or use in damp or dusty areas, and where real-time information and updating is crucial. RuggedPCReview has now had the chance to examine GammaTech’s solution, and here is what we found. According to the folks at VDC Research, the worldwide market for rugged tablets in enterprise Line-of-Business deployments will slowly grow from about US$590 million in 2016 to about US$640 million in 2020, not a tremendous lot, but also not pocket change either. And, interestingly, VDC Research foresees 2-in-1 devices with screens larger than 10-inches tablets to be in most demand. So there. If tablet/keyboard hybrids are the salvation of the tablet market and a growth industry, why hasn’t anyone thought of this before? It has been thought of before. Over the past couple of years we’ve seen an increased number of tablets with integrated or optional key “boards” that were more than just waver-thin, magnetically attachable display covers. How did this come about? After all, the entire purpose of a tablet is having a device WITHOUT a heavy keyboard to weigh you down. No physical keyboard indeed works great for consumer market media consumption tablets running Apple’s iOS or Android, operating systems specifically designed for handhelds and tablets. The lack of a keyboard is a much bigger thing with Windows which, try though Microsoft might, simply doesn’t work well with touch. And it so happens that while Apple and Android totally dominate the smartphone and most of the consumer tablet markets, on rugged tablets Windows is way ahead. VDC Research predicts that Android might reach a paltry 15% rugged tablet market share by 2020. Hence the importance of good 2-in-1 devices in the rugged markets. And this is where history is repeating itself. So anyone planning on cashing in on hybrid devices better know what happened, and didn’t happen, before. Spool back a full quarter of a century, to the early 1990s. Millennials, especially, will be shocked and dismayed to learn that there were tablets back then. There was the IBM ThinkPad, the Toshiba Dynapad, the NEC VersaPad, the GRiDPad, the Sharp Expert Pad and many other books, slates and pads. Sadly, early pioneers quickly realized that Windows didn’t work well on those tablets and that handwriting recognition didn’t work nearly well enough to replace a keyboard. So one by one, these early pioneer tablets either vanished or were replaced by — you guessed it — hybrids and 2-in-1s. There were any number of innovative solutions back then, but since classic Windows was so entrenched, none of them ever worked well enough to really make a difference. Microsoft’s Bill Gates, however, actually liked the idea of pen tablet computers and, a decade later, launched the Tablet PC initiative. The Tablet PC was supposed to be a slender, light slate with an active pen for digital inking, editing, and basically a full replacement for the mouse. However, before the Tablet PC was even formally and officially introduced in 2001, both Microsoft and its hardware partners got cold feet and decided it might be better to make the Tablet PC — you guessed it again — a hybrid. So there were any number of convertible notebooks that worked as laptops, but you could also flip around the display and then you had a (rather thick and heavy) tablet. Too heavy, too expensive — Hybrids where the keyboard remained a permanent part of the device did have some success, and several are available today. But since the innovative hinged and attachment solutions added cost, and the permanently attached system/keyboard part weight, the resulting devices were too expensive as laptops and too heavy and bulky as tablets. Top-heavy — Hybrids with detachable keyboards didn’t have that problem, but they had another one: with the keyboard very light (since the actual computer was in the tablet part) and the tablet rather heavy, those designs were invariably “top-heavy” and not very stable. To make matters worse, the absolute imperative for tablets to be as super-slender as possible made keyboards so thin as to be largely unusable. Poor keyboards — I already mentioned the quality of detachable keyboards. Many are available for tablets, either as non device-specific external keyboards or as device-specific designs. Of those, the generic USB or Bluetooth keyboards generally work better, but they are really just a peripheral and not something that makes a tablet a hybrid. The device-specific ones are most often just terrible, due to their excessive thinness. Weird solutions — There were, and are, also various designs where the keyboard did remain a permanent part of the device, but in various novel and innovative ways. For the most part, interesting though they were, they remained nice solutions. The good news is that most of the issues listed above can be resolved. And they have to be resolved if hybrids/2-in-1s are indeed to be as successful as the prognosticators predict. They wanted to offer their customers a true 2-in-1 solution. That meant neither a totally new design with some sort of rotatable or flippable keyboard, nor a totally separate external keyboard that would simply plug into a USB port. Instead, the solution would be a keyboard that, while detachable, formed a strong physical connection with the tablet. The keyboard had to be heavy and sturdy enough to form a solid foundation when the hybrid was going to be used as a notebook. That also meant a strong, reliable hinge mechanism, and a tablet that was light enough to not make the combo top-heavy and prone to falling over. The keyboard itself had to work just as well as a standard rugged laptop keyboard. That meant tactile feedback, optimal key travel, proper scaling, and a standard key layout. GammaTech’s answer was to use their existing DURABOOK R11 tablet and work with the specialists at iKey on the keyboard part. The DURABOOK R11 is a fully rugged high-performance tablet with a large 11.6-inch display that’s also remarkably light and thin. The tablet is only 0.78 inches thick and weighs just 2.73 pounds. That means it’s barely thicker and heavier than the keyboard case of some rugged notebook computers. Extra attention was paid to the hinge. This has historically been the weakest point of tablet/keyboard combos, but GammaTech and iKey certainly nailed it here. The hinge is extremely solid, providing a trust-inspiring feel and plenty enough friction to keep the tablet from flopping or twisting too easily when it is inserted. 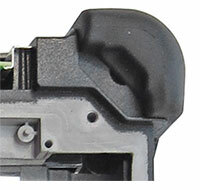 Connection is via the tablet’s 35-pin surface mount docking connector, and the tablet is very securely held in place via two large thumb-wheel screws. They keyboard is all black with primary symbols in large white print and secondary ones in yellow print. There is the same amount of mechanical key travel and resistance as is expected from a good notebook or desktop keyboard. It’s a hybrid between a standard and a membrane design in that while the keys are mechanical, there is also a sealing 3D membrane overlay. How does it work? Amazingly well. 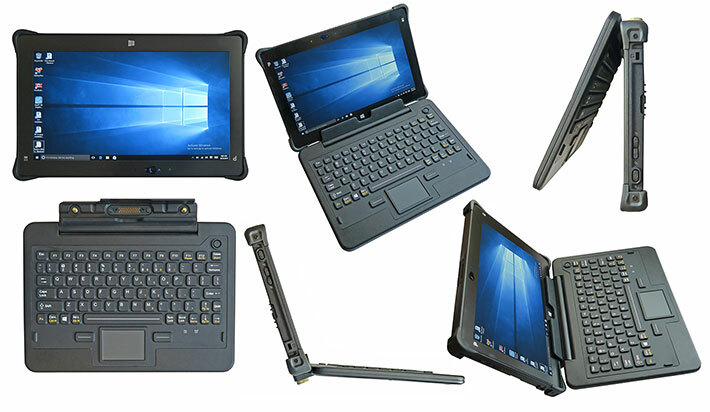 Once the R11 tablet is inserted into the keyboard and the two thumbwheel screws tightened, it works just like a rugged notebook computer, and feels just as solid and stable. If anything, there is actuallyless of the annoying display flex that so often bedevils laptops with touch screens. There are a couple of issues that we’d like to see resolved. One is that there is no visual or tactile guide when inserting the tablet into the high-friction bracket part of the keyboard hinge. You just have to eyeball it and then hope you’re in the right spot for the two thumb-wheel screws to go in. Another is that when you close the combo like you would a regular notebook, there remains about a half inch gap. We’d rather have it lay flat. Finally, and that’s perhaps nitpicky, but we always like the QWERTY part of a keyboard layout to be 100%-scale, i.e. just like a desktop keyboard. This one is 97%, perhaps not enough to throw off touch typists, but 100% would be better. 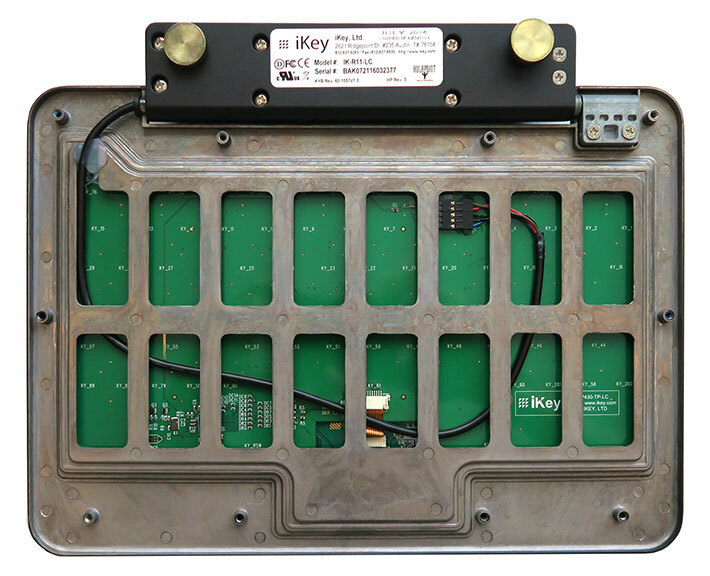 As for sealing, while most detached iKey keyboards are IP67 rated (i.e., they can survive immersion), the rotating hinge of this assembly limits sealing to the IP54 level. That still means it’s dust-proof and can handle water sprayed from all direction, but no dropping it into a puddle. Since the R11 GammaTech sent us with the new keyboard was the new, updated version of the tablet, we took the opportunity to run full benchmarks. That’s because the original R11 we tested in May 2015 has been updated under the hood. dollars for the chip alone. There are thermal, performance, power usage and integrated features considerations, and also how a product fits into the competitive landscape. For the DURABOOK R11, GammaTech initially went with the low voltage Core i5-4200U from Intel’s lineup of “Haswell” 4th generation mobile Core processors. With Haswell, Intel made major steps forward in combining excellent performance with remarkably frugal operation and greatly improved integrated graphics. Running at a base frequency of 1.60GHz and a maximum turbo speed of 2.60GHz, the dual-core i5-4200U includes integrated Intel HD Graphics 4400 while having a suitably low thermal design power of just 15 watts. Thermal Design Power is an Intel measure of the maximum processor heat a cooling system has to be able to remove, and also a rough measure of maximum performance. Commendably, GammaTech updated the R11 with “Broadwell” 5th generation Core processors as soon as those became available, offering the Core i5-5200U that was in our most recent review unit, and also a high-end Core i7-5500U. Both of the new chips uses Intel HD Graphics 5500. Else, Broadwell is not very different from Haswell, it being a “tick” in Intel’s “tick-tock” rhythm of shrinking the process lithography and then revamping the processor architecture. So Broadwell, in essence, shrinks Haswell and streamlines this and that along the way. To see what kind of performance the Broadwell-powered DURABOOK R11 provides with its dual-core Core i5 processor, we ran our standard benchmark suite, Passmark Software’s PerformanceTest 6.1, that runs about 30 tests covering CPU, 2D graphics, 3D graphics, memory, and disk and then computes scores for each category and an overall PassMark score. We also ran our second benchmark suite, CrystalMark, for confirmation and additional information. For comparison, we included benchmark results of an older Haswell-powered R11 we had tested, GammaTech’s S15AB rugged notebook that uses the same chip as the new R11, and two competitor tablets in the large-screen rugged tablet market. Looking at the results of the initial and the latest R11, the numbers show a modest improvement of about 10% in the processor benchmarks. With efficiency mattering most these days, you just no longer see the massive performance jumps between generations. It’s more and more about cleverly matching the right processor to the right storage media and the right OS for a task. Case in point here is the new R11’s quicker disk benchmark numbers. The differences between the three large-screen tablets comes down to processor and mass storage configuration. The slightly heavier and slightly larger Getac F110 has a bit more battery capacity and the last one we tested came with the Core i7-5500U that’s available as an option for the R11. Xplore’s Motion R12 went with an ultra-low voltage processor best suited for its targeted markets. In our day-to-day testing, the DURABOOK R11 felt very quick and responsive, and was up to any workload we threw at it. We normally do battery draw benchmarking with PassMark BatteryMon, but the utility was unable to determine draw in the R11. As is, GammaTech estimates seven hours on a charge. Based on our experience with similarly equipped systems, this should easily be possible. 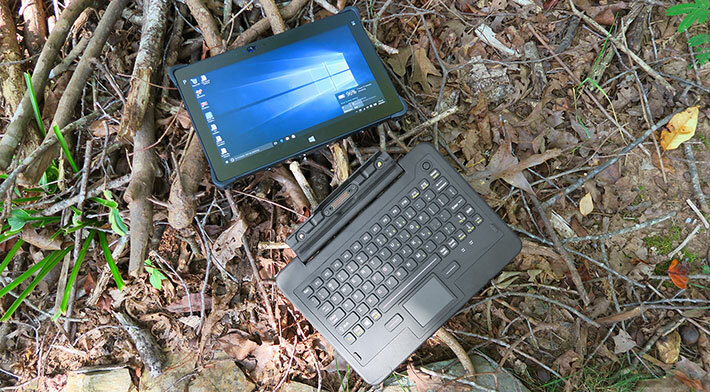 While the primary focus of this article is on the value-added and extra functionality of the keyboard that turns the R11 into a 2-in-1 hybrid device, we’ll add here the ruggedness section of our original May 15 review of the R11. GammaTech’s stated goal for the R11 was to redefine what a rugged tablet PC is. In essence, what they meant was that the R11, while being ultra-thin and very light, would offer all the ruggedness and sealing customers expect from a fully rugged device. Can the R11 pull it off? For drops, testing is conducted in modified accordance with the procedures described in MIL-STD-810G, Method 516.6, Procedure IV. Drops are from a height of 48 inches onto 2-inch plywood over concrete, with the unit powered on. Being able to survive four-foot drops is relevant because that is roughly the height the tablet would fall if it slipped out of the hands of someone operating it in a standing position. GammaTech also states shock and vibration resistance in testing similar to MIL-STD-810G, Method 514.6, Procedure I, Category 24, Fig 514.6E-1 which vibrates the unit while it is powered on at prescribed frequencies for an hour per axis. This test does not simulate an application environment, but rather suggests that a device that can pass that test will survive in the field. That’s perhaps a bit vague and difficult to comprehend, but that’s the supplied data. On the sealing front, GammaTech claims IP65-level ingress protection. The “6” means complete protection against dust, and the “5” means protection against low pressure water jets from all directions. What that means, is that the R11 can handle any degree of rain, but it shouldn’t be hosed down with a pressure washer or submerged into water. Needless to say, the experts here at RuggedPCReview decreed that the R11 looked like it could survive a good dunk. And it did. The operating temperature range is given as -4 to 131 degrees Fahrenheit (-20 to 55 centigrade). That’s plenty good enough for most conceivable operating environments, including commercial freezers. Do note that Twinhead, GammaTech’s corporate mothership in Taiwan, has decades worth of experience making all sorts of rugged computers. Twinhead is who made all those rugged and ultra-rugged Itronix notebooks, and Twinhead is a major rugged equipment OEM to a lot of system integrators and resellers around the globe. They absolutely know what they’re doing. Apart from the given specs, our detailed examination of the R11 revealed an exceptionally sturdy design and construction. The rigid internal magnesium chassis keeps the unit from flexing, which guards against display breakage. Further protection is provided by the low-tech but extremely effective and easily replaceable corner rubber bumpers. IP65 sealing against the elements is sufficient, but do keep in mind that the port cover must be firmly in place and all seals must be undamaged in order to provide that protection. And also keep in mind that some parts of the tablet are technically outside the sealed areas (like the fan and antennae), so liquids can get in there. Which means that after heavy exposure those areas should be examined and dried out. But what about the expansive glass surface? It’s chemically hardened to a surface hardness of 7H, which is harder than regular window glass or a knife blade (those are about 5.5H), harder than pumice (6) and harder even than a steel file (6.5H). So it’s not likely to get scratched. When we initially reviewed GammaTech’s DURABOOK R11 in May 2015, we were quite impressed. The tablet is both sleek and light, and also rugged as can be. 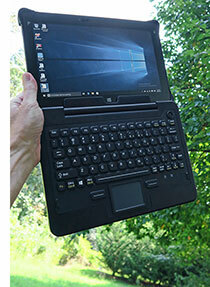 We loved the large 11.6-inch display that made the device suitable even for Windows power users. The latest technology upgrades and the availability of the attachable keyboard make the R11 that much more desirable yet, and also add plenty of new functionality. Now based on a frugal but powerful Intel “Broadwell” Core i5-5200U processor (with an optional i7-5500U available), the DURABOOK R11 is a very good performer, aided by its very quick solid state disk. The slender profile of the tablet only allows for a relatively small battery 45.8 watt-hours, but that should be enough for almost a full 8-hour shift. The R11 has a satisfyingly large 11.6-inch display with 1366 x 768 pixel wide-format resolution that remains usable outdoors, especially with the optional 700 nits display that came with our test unit. The capacitive multi-touch screen is very responsive and even works with thin gloves. An active pen option is for those who like to draw or annotate, or need extra precision. Given its sleek, lightweight design, the DURABOOK R11 doesn’t look like a rugged tablet. But it is, and remarkably so, thanks to its strong magnesium chassis, solid design, and nicely integrated corner bumpers. IP65 ingress protection means the tablet is dustproof and can easily handle any amount of rain.